Jemma has spent her life scavenging tools and supplies in her tribe’s small enclave outside what used to be a big city. Now she’s a teen, and old enough to become a Mama. Making babies is how her people survive—in Jemma’s world, life ends at age seventeen. 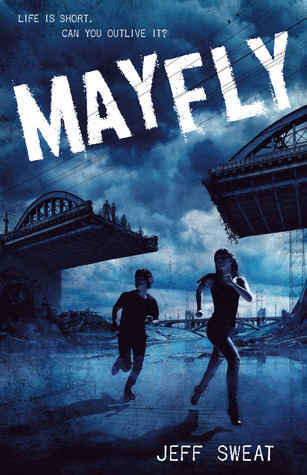 Set in a somewhat sexist sounding society Mayfly by Jeff Sweat is a young adult dystopian scifi thriller. At some point the world has mostly died off leaving children raising children to carry on the human race. Seventeen has become old age in this society so the kids need to grow up fast to begin having their babies before they go. Jemma knows nothing other than trying to survive but now that she’s at the age to become a Mama she’s not sure that is what she wants. Generally in Jemma’s world the boys become the Muscle and the girls become Mamas with little other options. But Jemma and her best friend Apple have decided to set out away from Holy Wood, the place they’ve known as home, to find out what is causing them to die off before the chance to even live. Now when it comes to the idea that society has pretty much ended and those left can’t live past seventeen you can definitely say I’m going to be curious as to why and pick up the book. The world that has been created in here is really somewhat offensive to today’s standards pretty much taking a step back to the caveman era with woman only good for making babies but truth be told that made my curiosity shoot up even more to the hows and whys. But I have to question at the back of my mind who thought it was such a good idea to spend an astonishing long amount of time in the book with the characters repeatedly discussing “rolling” around with one another? This is still YA and we all get how babies are made and whether it’s graphic or not it kind of got a bit irritating to keep dwelling even with their cutesy made up words. So anyway, now that the “rolling” rant is over let’s get on with the rest of the review for this one. To me the pacing was rather slow for the first half of the book but to be honest a lot of that time was the establishing the baby making society to it could have just been my own irritation with not progressing beyond that part. Once you get going past that and the adventure to finding answers starts the story picked up for me and saved itself from an even lower rating. At this point I actually began enjoying the book and the action going on and anxiously awaited what drew me in to begin with which was the cause for society to crumble. There are moments in here that remind me of something like The Maze Runner with the age of the characters and as I’ve mentioned some of the words and how they talk. Jemma’s idea of not conforming to what is expected of her could remind some of things like Divergent too where everyone is expected to fit into a certain box and not be different from others. So if if these types of books appeal I’d say you might want to give this one a go. He loves to travel and writes everywhere he goes, even when there’s not a desk. He likes karaoke, motorcycles and carpentry. He was once shot in the head with a nail gun, which was not as big of a deal as it sounds. But it still hurt like crazy. LOL Yep, the story thankfully got better once it moved on and they go out looking for answers. A tonsof five star reviews on it though which kind of surprises me I’m the only one annoyed with the beginning.